Today, I have swatched TheBalm's TimeBalm concealer. I didn't manage to swatch all the shades, because unfortunately the shop only had the lighter to medium shades available. I know, breaks your heart, doesn't it? Sometimes, it just seems that darker girls have it hard when it comes to beauty - first of all, many brands don't make colours with them in mind. And when they do, sometimes the retailers don't even want to carry them! But nevertheless, I swatch whatever I can, and whatever is available to me, and I hope it helps somebody. So here you go, swatches. The names are really cutesy, ranging from Lighter than Light (which honestly isn't THAT light), to Light, and then it starts getting uncreative - Light-Medium, Medium, and the really inexplicably named Mid-Medium. The texture of the Timebalm concealers is pretty smooth and decent, without being over-emollient. 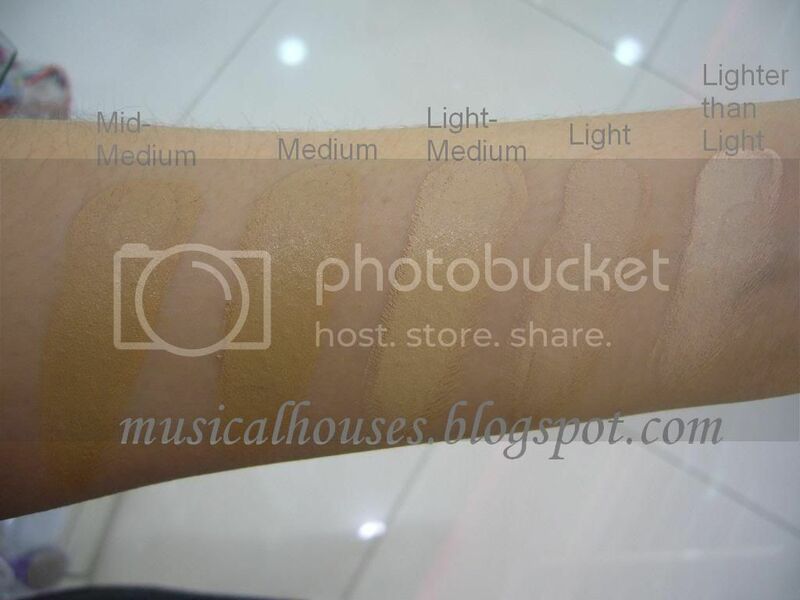 Pigmentation is also very decent, each of these swatches being 2 - 3 stripes - that's total opacity with 2 - 3 swipes of product. Overall, a not too shoddy product. Not bad at all. They also seem to be getting a lot of love in general, so I guess it's worth trying out, if you can find one in your colour. Lighter than Light is a very pink-toned pale flesh colour, that I would guess is probably NW15 or NW10? I'm not too familiar with the NW colours. Light is neutral-to-cool-toned pale flesh colour that, but not as pale as Lighter than Light. Light-Medium is a hair darker than NC20 (that's my colouring), and is yellow-undertoned. It's definitely similar to NC20. Medium is what I'm guesing NC25 would be, although I don't really know. Also slightly yellow-toned, athough I think it's neutral enough. Mid-Medium is a neutral-undertoned flesh shade, although it might just veer towards yellow undertones. The good thing about the TimeBalm concealers is that most of them, with the exception of Lighter than Light, have pretty more-or-less neutral undertones. Sure, each individual veers slightly towards warm or cool, but they're all close enough to neutral to be wearable for most people. I've been really tempted by this but unsure whether I'd be lighter than light or light (and I've heard these do run quite light) so thanks so much for the swatches. I'd definitely be light, I think. Thank you so much. I've been searching the web for swatches of timebalm for 3 hours :) I've nowhere else to try out and decide the color of this concealer, I'm going to get it online. I guess light medium will suit me best! I wish I had read this post months earlier. I'm NC25 and fall between the Light-Medium and Medium shades. I know this because I have both! I love this brand but the concealers aren't that great at covering dark circles - they're kind of like a thicker version of foundation. The good thing about it is that it's supposed to be packed with Vitamin E and all that supposed good stuff, to the point that TheBalm claims you can wear them to bed. I don't, and haven't, but there ya go. Im 52 in bourjois healthy mix.. would light or light medium work for me? I already have the light tinted moisturizer. @Anonymous: Oh dear apologies for the late reply! I'm not familiar with Bourjois foundations, but if Light is working for you, you could probably continue to stick with it. Hi, I am wearing nc35 or c4 mac foundation and illumasqua 215 concealer. Do you think I should go for the light/medium or medium concealer for my under eye ? @Anonymous: I'm not too sure honestly as it depends on a number of factors (eg how dark your circles are and how you plan to use the concealer), but I'm going to guess Medium. However I suggest going to a store to check these out in person before buying - concealer can be tricky! Hope this helps! Hi. In light of the review above and swatches, can you tell me which one is the lighter shade: medium or mid-medium? coz honestly I cant tell the difference and I have both, hence looking for a second opinion to repurchase just one of those shades. @nariman: I don't think it's so much of which one is lighter or darker, but which one is more yellow vs more pink. I feel like both are the same "darkness", but Medium is slightly more yellow and Mid-Medium is slightly more pink. If I had to choose, I'd say maybe Mid-Medium is ever so slightly darker than Medium. Hope this helps! hello! i wear the shades NW20-NW25 in MAC concealers for under my eye. i would like to purchase on of these but im not sure what shade to buy for under the eye. what do u recommend? @Anonymous: For NW20-NW25, I'd suggest Light, but it may be a good idea to test in-store if possible. Hope this helps! Hi, I have a similar question to the above, but I am an NC15, so usually go for light concealer, but dont want it to be too pink. Plus my undereye circles are quite purple so Im guessing I need a reasonably dark, yellowy concealer. But would light-medium be too dark?? Dont want to look more like a panda! @GeraldineClaire: NC15 is pretty fair, so you'd probably have to go for the paler shades. But your concerns over the lighter shades being too pink are probably well-founded. I'm guessing since you're fair, and your eye circles are purple, you'd need a yellow-based concealer to counteract the purple. You could try Light (it's not as pink as Lighter than Light), and see if it works, as I suspect light-medium may be too dark. If possible, try to test in person before buying, or buy from a store with a good returns policy. Hope this helps! Hi, same question as above, but I am an NC15 so normally go for light colours, however I dont want it to be too pink for my dark undereye circles so would i go for light-medium? Dont want to look like more of a panda!! Thanks for the swatches. I am wearing foundation in nc35-40. And I do have this concealer in light/medium. I think maybe I should've gone for medium. But it looks fine as it has to be lighter than foundation. One problem with this concealer is that it is not as creamy as some people say ! When I dab it in the corner of my eye, it looks dry and somehow patchy ! It sits in the fine lines as well ! I tried to try it on the eye cream, but still the same problem. The concealer is very well pigmented and this is why I am still trying to solve the problem. Thank you for swatches! It's so considerate of you to swatch ones that you wouldn't necessarily use! :) I've been looking high and low for a comparison swatch of medium, mid-medium and medium-dark timeBalm and I'm glad I was able to compare at least two of them from your swatches. Cheers!